From delicious grilled cheese to warm, gooey paninis, here are 10 amazingly melty sandwiches. The best grilled cheese is the gooiest grilled cheese, says author Laura Werlin. Chef Tommy Habetz's delicious sandwiches have the ideal tuna-to-cheese-ratio and feature balsamic vinaigrette instead of manyonnaise. This decadent take on eggs Benedict features scrambled eggs, bacon, Gruyère cheese and jalapeños, topped with classic hollandaise sauce. Upgrade the classic grilled cheese with layers of mozzarella, goat cheese and tomato-sauced spinach. These fast ham-and-cheese sandwiches are miniature versions of the ones served at Le Meurice hotel in Paris. For an indulgent version of the classic tuna melt, Vitaly Paley pairs moist chunks of crab with brioche, truffle butter and Gruyère cheese. Wolfgang Puck's over-the-top hot dogs are filled with cheese and wrapped in bacon. Top Chef alum Michael Voltaggio flavors this incredible grilled cheese with mostarda— a tangy, fruity condiment. These incredible melty sandwiches feature fresh mozzarella, fontina, Gorgonzola and provolone cheese. 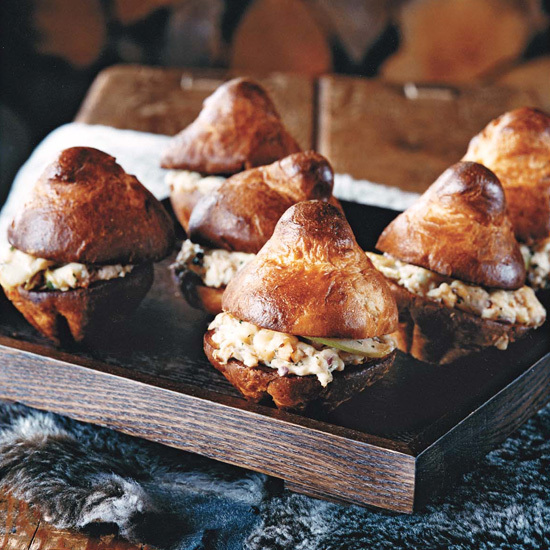 Terrific for lunch or as a snack, these open-face sandwiches feature bubbling hot Gruyère cheese.